by online teachings on December 1, 2012 in Bodhicharyavatara, Teachings. With video BA5_76-83 Rinpoche completes the teaching from the section on the discipline of accumulating positive deeds, with stanzas 76 to 83 of the Fifth Chapter of the Bodhicharyavatara, Vigilant Introspection. We are also studying the commentary transcript on Chapter 5, which you can download here and in the Library section. Further recommended reading: the commentary book by Kunzang Pelden (Khenpo Kunpal), The Nectar of Manjushri’s Speech, p. 186-189. You’re questions are most welcome. 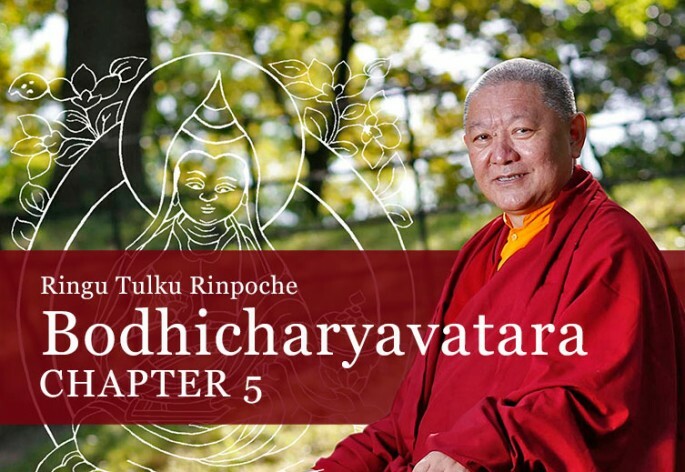 Please log in and leave your questions for Rinpoche as a comment below, or send them via email to studyquestions[at]bodhicharya.org. It is helpful if you can use one short paragraph and, if possible, less than 80 words. Any questions longer than that may have to be edited so please be concise. Questions will be collected from here on Friday, December 7, 2012, and included in Rinpoche’s answers video. After that date please send any questions relating to this video teaching via email to studyquestions[at]bodhicharya.org. Thank you for that so meaningful teaching. Dearest Rinpoche, thank you so much, these teachings are so wonderful and precious. How lucky we are to be able to touch them with your excellent help. Specially today I wish to thank you very gratefully for this last teaching which is so helpful for me to correct my own mistakes, hopefully I wish to be able to fully integrate all that you have explained. Love Yumma. dear Rinpoche, thank you for these teachings which sound so practical and helpful in daily life, but sometimes, under stressful conditions, I find it hard to remember to put them into practice. Is it best to have a firm and strong resolve to accumulate positive deeds or is it better to be more relaxed about it and to hope that in time it will get easier?